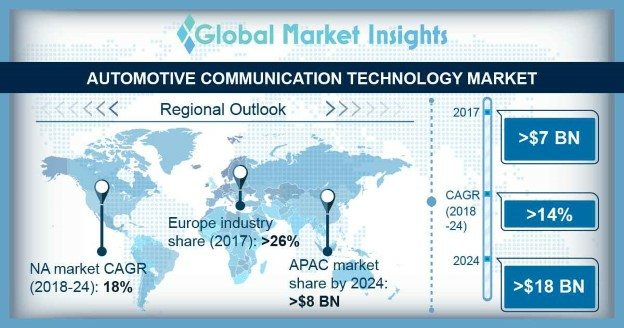 Automotive Communication Technology Market size is set to exceed USD 18 billion by 2024; according to a new research report by Global Market Insights, Inc. The automotive communication technology market growth is attributed to the increasing demand for automotive electronics. Over the last decade, the total contribution toward automotive electronics has increased from around 20% to 45%. Inventions such as automatic transmission, anti-lock brakes, telematics, and infotainment capabilities are revolutionizing the automotive industry, driving the market demand. The electronic systems also assist in meeting the safety regulations such as adaptive cruise control, blind spot detection, and lane chase assist, encouraging manufacturers to incorporate these systems into their vehicles. All these subsystems are connected to the central gateway through various bus modules including CAN, MOST, and Ethernet, enhancing in-vehicle communication and safety. Furthermore, the growing purchasing power, rapid urbanization, economic growth, and rise in the per capita ratio are the major factors contributing to the growth in the sales of luxury vehicles, having a positive impact on the automotive communication technology market. The government has also established various regulations for improving the fuel economy of cars and augmenting vehicle safety, contributing to the automotive communication technology market growth. The MOST bus segment is growing at a steady rate in the automotive communication technology with a market revenue of over USD 1 billion in 2017. The MOST bus is used to provide in-vehicle infotainment and multimedia systems with precise communication during the transmission of data, audio, video, and control information. The MOST bus offers data efficient communication infrastructure for interconnecting infotainment and multimedia devices such as GPS navigation, radio, video display, and active speakers. The latest version MOST150 offers a speed of around 150 Mbps, enabling its usage in various automotive communication applications. However, as the MOST bus is provided by a limited number of suppliers, the cost is relatively high due to which automotive manufacturers are now shifting toward the Ethernet network as it acts as a cheaper and flexible alternative. The economy car segment is growing at the fastest rate in the automotive communication technology market and is projected to grow at a CAGR of over 16% over the forecast timeline. The major factors contributing to the market growth include the rising demand for vehicular safety from the economy class vehicle consumers and stringent government regulations for emission reduction. Hence, the economy car manufacturers are working with various automotive industry standards organizations to develop efficient networking solutions thereby meeting the stringent design constraints. This has contributed to the introduction of features such as ADAS, advanced safety, and user-friendly infotainment system into the cars, driving their adoption rates. The introduction of networking technologies in these vehicles is growing rapidly, contributing to the automotive communication technology market growth. The distributors segment is growing rapidly with a projected CAGR of over 17% over the forecast timespan. The communication technology providers mainly align with the distributors to provide its technology to automotive manufacturers worldwide. The distributors dominate the aftermarket landscape by developing strategies to deepen their relationship with customers, driving the company sales. They also provide an insightful understanding regarding the prevailing market conditions and the changing customer requirements, which enable companies to bring about necessary transformations in its offerings, contributing to the automotive communication technology market growth. The safety & ADAS segment dominates the automotive communication technology market with a projected market revenue of over USD 8 billion by 2024. The automotive systems have become more sophisticated as they include ADAS applications from collision avoidance, automatic emergency braking, and lane departure warning to autonomous driving, making the system bandwidth critical. To meet this high bandwidth and latency requirements, it is essential for automotive manufacturers to provide high-performance network connectivity. The use of automotive Ethernet in these systems delivers a single in-vehicle network, enabling a seamless cross-domain communication and accelerating their adoption rates in the automotive communication technology market. The Europe automotive communication technology market held over 26% of the market share in 2017. The growth in this region is attributed to the rising awareness regarding automotive safety among citizens and stringent government regulations. The region is also the home for leading automotive semiconductor providers such as Elmos Semiconductor, NXP Semiconductor, STMicroelectronics, and Vector Informatik, which contributes to the market growth in this region. Poland is one of the fastest growing countries in this region and is anticipated to be the second largest automotive hub in Europe after Germany. The companies operating in the global automotive communication technology market are focusing on bringing about innovations in production technologies, resulting in the development of advanced solutions for the automotive communication technology market. Major players functioning in this market include On Semiconductor, NXP Semiconductor, Microchip, Continental, Broadcom, Intel, Qualcomm, Renesas, Vector Informatik, Robert Bosch, Elmos Semiconductor, Xilinx, STMicroelectronics, Melexis, Infineon, Cypress Semiconductor, and Texas Instruments. These players are also entering into strategic partnerships with various automotive manufacturers to expand their presence and gain a competitive edge in the automotive communication technology market.